From Westchester: Take the Metro North to Grand Central Station. Take taxi from Grand Central Station to the building or by subway take the Shuttle train (S) to Times Square. Take the #1, 2, or 3 train to the 96th street station. Exit at 94th street exit. Walk downtown (south) on Broadway one block to 93rd street. Turn right (west) on 93rd street. Walk 2 blocks to Riverside Drive. 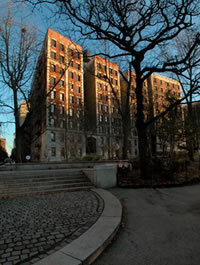 Turn left (south) on Riverside Drive to the Terrace Court, 202 Riverside Drive, between 93rd and 92nd streets. Call (800) METRO-INFO (800-638-7646) or (212) 532-4900.